Al & Melody Bowers of Al’s Burger Shack and Mel’s Commissary & Catering along with Flyleaf Books and guest chef Bill Smith present Cooking the Books. 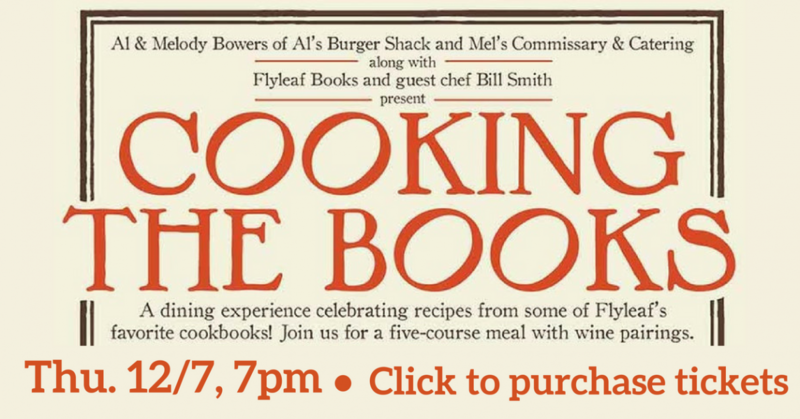 A dining experience celebrating recipes from some of Flyleaf’s favorite cookbooks. Join us for a five-course meal with wine pairings. The cookbooks will be available for purchase at the event. $50 per person, gratuity not included. Hattie’s Restaurant has been bringing classic Southern cooking to Saratoga Springs, New York, since 1938, when Louisiana native Hattie Gray, then a household cook, saved up enough money to start Hattie’s Chicken Shack. Now, their traditional and timeless fare can grace your kitchen with the Hattie’s Restaurant Cookbook, by Hattie’s owner and chef Jasper Alexander. This book traces the restaurant’s history from the beginning to the present through recipes, anecdotes, and photographs. Crabs and oysters take center stage as Chef Bill Smith conveys his passion for preparing these sumptuous shellfish long associated with southern coastlines. Smith's sensibilities as a North Carolinian born and raised down east are vibrantly on display as he recalls the joy of growing up catching crabs and shucking oysters. Smith traveled the coastline, visited with crab fishermen and oyster farmers, and dove deep into a library's worth of regional cookbooks and collections of heirloom recipes from seaside communities, notably in North Carolina and Louisiana. His collection of fifty recipes, organized by courses, ranges from simple, everyday preparations to elaborate ones suitable for fancy parties. From Crabmeat Cobbler, Roasted Oysters, and Hard-Crab Stew with White Cornmeal Dumplings, to Crabmeat Ravigotte and Oyster Shortcake, cooks will find a succulent recipe for every occasion. The book includes seasonal selection information and detailed cleaning and preparation instructions for hard- and soft-shell crabs and oysters. This is really the EASIEST COOKBOOK IN THE WORLD. Every recipe has less than four steps and fewer than six ingredients, illustrated with more than 1,000 user-friendly photographs. No wonder it is an overnight international bestseller! Want a quick answer to “What should I eat?” Simple-with its clean design, large type, straightforward photos, and handy icons-will have you enjoying a meal in minutes. Through combinations of basic flavors and fresh ingredients, chef, food photographer, and cookbook author Jean-François Mallet helps anyone, the novice and gourmand alike, prepare tasty time-saving meals. His “at-a-glance” approach will change your relationship with your kitchen. Edna Lewis is renowned as one of the greatest American chefs and as an African-American woman who almost single handedly revived a forgotten world of refined Southern cooking. Lewis (1916-2006) also had a remarkable life story. She was born and grew up in rural Virginia in an area called Freetown. She learned to cook from an extended family that included grandparents who had been enslaved. Lewis’s first book, published in 1972, contains over 100 recipes, arranged in menu form and organized according to the season of the year: Spring, Summer, Autumn, and Christmas. With its focus mostly although not exclusively on Southern food, it began the revival of true Southern cooking.